Louis Pasteur (December 27, 1822 – September 28, 1895) was a French chemist best known for his remarkable breakthroughs in microbiology. His experiments countered the common view of spontaneous generation and confirmed the germ theory of disease, and he created the first vaccine for rabies. Pasteur is best known to the general public for describing how to stop milk and wine from going sour: This process came to be called pasteurization. Pasteur is regarded as one of the three main founders of bacteriology, together with Ferdinand Cohn and Robert Koch. He also made many discoveries in the field of chemistry, most notably the asymmetry of crystals. Louis Pasteur represented some of the best of science, using his creativity and intelligence to elucidate key scientific principles and working tirelessly to find cures for diseases of animals (anthrax, chicken cholera) and of humans as well (rabies). His discoveries saved countless lives and provided great economic value to society. At times, Pasteur did it when there was personal risk, as well as under the glare of public scrutiny, where failure would have been personally embarrassing. Perhaps the spirit of Pasteur is reflected in the first case where a rabies vaccine was tested on a human subject. Although Pasteur was convinced years of testing were still needed before being used on a human, the mother of a young boy appealed to him to save her young son, who had been badly mauled by a rabid dog. Pasteur risked potential prosecution to save the boy's life. As in other cases, where Pasteur risked himself publicly, the result was successful. Pasteur was also an ardent Catholic throughout his life. A well-known quotation illustrating this is attributed to him: "I have the faith of a Breton peasant, and by the time I die I hope to have the faith of a Breton peasant's wife." 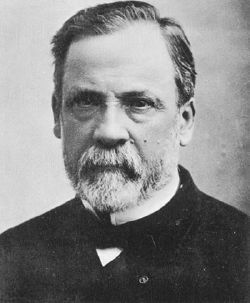 Louis Jean Pasteur was born on December 27, 1822, in Dole in the Jura region of France and grew up in the town of Arbois. There he later had his house and laboratory, which is a Pasteur museum today. His father, Jean Pasteur, was a tanner and a veteran of the Napoleonic wars. Louis's aptitude was recognized by his college headmaster, who recommended that the young man apply for the École Normale Supérieure (prestigious institution of higher education, outside the public universities), which accepted him. After serving briefly as professor of physics at Dijon Lycée in 1848, Pasteur became professor of chemistry at Strasbourg University, where he met and courted Marie Laurent, daughter of the university's rector in 1849. They were married on May 29, 1849, and together they had five children, only two of whom survived to adulthood. In Pasteur's early works as a chemist, he resolved a problem concerning the nature of tartaric acid (1849). Tartaric acid is a crystalline organic acid that occurs naturally in many plants, particularly grapes, bananas, and tamarinds, and is one of the main acids found in wine. A solution of this compound derived from living things (specifically, wine lees) rotated the plane of polarization of light passing through it. The mystery was that tartaric acid derived by chemical synthesis had no such effect, even though its reactions were identical and its elemental composition was the same. 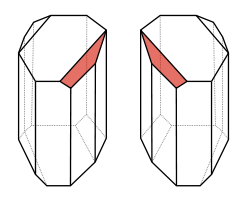 Upon examination of the minuscule crystals of sodium ammonium tartrate, Pasteur noticed that the crystals came in two asymmetric forms that were mirror images of one another, resembling one another as would left- and right-hand gloves. Tediously sorting the crystals by hand gave two forms of the compound: Solutions of one form rotated polarized light clockwise, while the other form rotated light counterclockwise. An equal mix of the two had no polarizing effect on light. Pasteur correctly deduced the molecule in question was asymmetric and that the organic form of the compound consisted purely of the one type. As the first demonstration of chiral molecules, it was quite an achievement. Pasteur's doctoral thesis on crystallography attracted the attention of M. Puillet and he helped him garner a position of professor of chemistry at the Faculté (College) of Strasbourg. In 1854, he was named Dean of the new College of Science in Lille. In 1856, Pasteur was made administrator and director of scientific studies of the École Normale Supérieure. A cornerstone principle of biology is that living organisms come only from other living organisms (excepting the original appearance of life on Earth). However, historically, people relying on their observations came to the conclusion that living organisms could arise virtually overnight from rotting meat (flies), stored grain (mice), mud (fish), clear broth (bacteria), and so forth. According to Aristotle, it was a readily observable truth that aphids arise from the dew that falls on plants, fleas from putrid matter, mice from dirty hay, and so forth. Experimental scientists continued to decrease the conditions within which the spontaneous generation of complex organisms could be observed. These include the work of Francesco Redi, who in 1668 proved that no maggots appeared in meat when flies were prevented from laying eggs and Lazzaro Spallanzani, who in 1768 showed that microorganisms could not appear in flasks of boiled broth left sealed. However, the opponents of Spallanzani disagreed with his conclusions, claiming that he had boiled the water so long that the "vital force" in the air was destroyed (Towle 1989). The spontaneous generation controversy continued into the mid-1800s and was so contentious that the Paris Academy of Sciences offered a prize to anyone who could clear up the issue (Towle 1989). 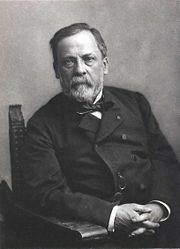 The winner was Louis Pasteur, whose experiments in 1862 disproved that organisms such as bacteria and fungi appear in nutrient rich media of their own accord. Pasteur utilized a long, curved necked flask in his experiments. Pasteur exposed boiled broths to air, but the curved pathway trapped particles, preventing their reaching the growth medium. The boiled broth remained clear and uncontaminated, even for more than a year, despite exposure to air, but when the curved necked of the flask was removed, the broth clouded with microorganisms within a day (Towle 1989). Similar results occurred when the vessels contained a filter to prevent all particles from passing through to the growth medium. Nothing grew in the broths; therefore, the living organisms that grew in such broths came from outside, as spores on dust, rather than spontaneously generated within the broth. In Pasteur's words: "Productions of infusions [liquids contaminated with microorganisms], previously heated, have no other origin than the solid particles which the air always transports" (Towle 1989). Pasteur claimed to "have driven partisans of the doctrine of spontaneous generation into the corner," leading to a sudden death of the theory of a continuing process of generation of life from non-living matter (Towle 1989). The germ theory of disease is that microorganisms are the cause of many diseases. 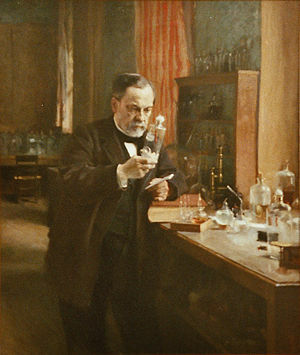 While Pasteur was not the first to propose the germ theory (Girolamo Fracastoro, Agostino Bassi, Friedrich Henle, and others had suggested it earlier), he developed it and conducted experiments that clearly indicated its correctness and managed to convince most of Europe it was true. For example, Pasteur used a drop of blood from a sheep dying of anthrax, grew this in a sterile culture, and kept repeating the process a 100 times, representing a huge dilution of the original culture (Cohn 2004). Yet, the final culture produced anthrax, proving that the anthrax bacillus was response for the disease, and establishing the germ theory (Cohn 2004). Today, Pasteur is often regarded as the father of germ theory and bacteriology, together with Robert Koch. Pasteur's research also showed that some microorganisms contaminated fermenting beverages. With this established, he invented a process in which liquids such as milk and beer were heated to kill most bacteria and molds already present within them. He and Claude Bernard completed the first test on April 20, 1862. This process was soon afterward known as pasteurization. Indeed, it was his earlier work on beverage contamination that led Pasteur to conclude that microorganisms infected animals and humans as well. He proposed preventing the entry of microorganisms into the human body, leading Joseph Lister to develop antiseptic methods in surgery. In 1865, two parasitic diseases called pébrine and flacherie were killing great numbers of silkworms at Alès. Pasteur worked several years proving it was a microbe attacking silkworm eggs that caused the disease, and that eliminating this microbe within silkworm nurseries would eradicate the disease. Pasteur also discovered anerobiosis, whereby some microorganisms can develop and live without air or oxygen. Pasteur's later work on diseases included work on chicken cholera. During this work, a culture of the responsible bacteria had spoiled and failed to induce the disease in some chickens he was infecting with the disease. Upon reusing these healthy chickens, Pasteur discovered that he could not infect them, even with fresh bacteria; the weakened bacteria had caused the chickens to become immune to the disease, even though it had only caused mild symptoms. This discovery was serendipitous. His assistant Charles Chamberland (of French origin) had been instructed to inoculate the chickens after Pasteur went on holiday. Chamberland failed to do this, but instead went on holiday himself. On his return, the month-old cultures made the chickens unwell, but instead of the infection being fatal, as usual, the chickens recovered completely. Chamberland assumed an error had been made and wanted to discard the apparently faulty culture when Pasteur stopped him. Pasteur guessed the recovered animals now might be immune to the disease, as were the animals at Eure-et-Loir that had recovered from anthrax. In the 1870s, Pasteur applied this immunization method to anthrax, which affected cattle and sheep, and aroused interest in combating other diseases. Pasteur publicly claimed he had made the anthrax vaccine by exposing the bacillus to oxygen. His laboratory notebooks, now in the Bibliotheque Nationale in Paris, in fact show Pasteur used the method of rival Jean-Joseph-Henri Toussaint, a Toulouse veterinary surgeon, to create the anthrax vaccine (Loir 1938; Cohn 2004). Pasteur did a public test in 1882, based on a challenge from well-known veterinarian Rossignol, and followed closely by the public and with daily news dispatches (Cohn 2004). There was a carnival atmosphere. However, it was a complete success, with all 25 control sheep dead two days after the final inoculation (May 5, 1882) and all 25 vaccinated sheep alive and healthy (Cohn 2004). This fame spread throughout France and Europe, and within 10 years a total of 3.5 million sheep and half-a-million cattle had been vaccinated. This discovery revolutionized work in infectious diseases, and Pasteur gave these artificially weakened diseases the generic name of "vaccines," to honor Jenner's discovery. Pasteur produced the first vaccine for rabies by growing the virus in rabbits, and then weakening it by drying the affected nerve tissue. He was Grande Croix of the Legion of Honor. He died in 1895, near Paris, from complications of a series of strokes that had started in 1868. He died while listening to the story of St Vincent de Paul, whom he admired and sought to emulate (Walsh 1911). Thousands attended Pasteur's funeral and he was buried in the Cathedral of Notre Dame. However, Pasteur's remains were reinterred in a crypt in the Institut Pasteur, Paris where he is remembered for his life-saving work. Appleton, N. 1999. The Curse of Louis Pasteur. Santa Monica, CA : Choice Pub. ISBN 0967233704. Cohn, D. V. 2004. Pasteur. University of Louisville. Retrieved May 15, 2007. Debré, P., and E. Forster. 1998. Louis Pasteur. Johns Hopkins University Press. ISBN 0801858089. Geison, G. L. 1995. The Private Science of Louis Pasteur. Princeton University Press. ISBN 0691034427. Latour, B. 1988. The Pasteurization of France. Harvard University Press. ISBN 0674657616. Loir, A. 1938. A L'ombre de Pasteur (Souvenirs personnels). Paris. Tiner, J. H. 1990. Louis Pasteur: Founder of Modern Medicine Mott Media. ISBN 0880621591. Walsh, J. J. 1911. Louis Pasteur. The Catholic Encyclopedia, Volume XI. New York: Robert Appleton. Retrieved May 15, 2007. A modern history sourcebook: Pasteur. Louis Pasteur @ About Biotech (where Pasteur is called the greatest benefactor of humanity). This page was last modified on 26 July 2018, at 14:17.